It’s convenient to dispose of freshwater fish tank water, kitchen byproducts and other unwanted materials by flushing them down the toilet, running them through the garbage disposal unit, or pouring them down the basement drain. But sending some common household materials down your drains can lead serious plumbing issues. Below, we list 10 things you should never send down the drain and explain why these items are harmful to your own plumbing, your community’s water processing infrastructure, and to the whole ecosystem. 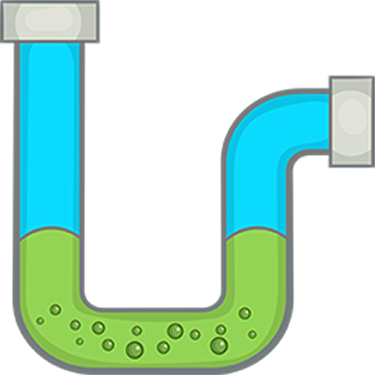 Grease, oil and fats.These solidify as they move through your drains and stick to the sides of the pipes. They also capture anything else that happens to be in the drain. Coffee grounds.Coffee grounds are fine particulates that are easily captured by grease and fats and add to the accumulation of gunk in your drain pipes. Egg shells.The outer hard shell is hard on your garbage disposal’s blades, and the thin inner membrane may wrap around its gears. Medications.Medications adversely affect the ecosystem you depend on for your water and not every water treatment facility can filter them out. Product stickers.That sticker on the skin of your fruit will adhere to anything that it contacts, adding to the buildup in your pipes. Be sure you remove the stickers before washing your produce. Paper products other than toilet paper.Disposable diapers, feminine hygiene products, wipes, paper towels and even tissues do not dissolve when they contact water. They have a high absorbency rate and can easily block your drains. Paper products also make your community’s water treatment plants work harder, which leads to increased maintenance and replacement costs. Flushable cat litter.Cat litter is meant to adhere to wet, sticky stuff: It will stick to the fats and greases on the walls of your pipes. Because it is highly absorbent, it will continue to expand as liquids pass through, increasing the risk of a clogged pipe. Paint.Even diluted paint products will become part of the residue building up on the walls of your drain pipes. And some paints—especially oil-based paints—are major polluters and should be disposed of through your county’s hazardous waste programs. Conventional cleaning products, including chemical drain cleaners.The ingredients in most of these products will degrade the metal and plastic components of your pipes over time. Moreover, conventional cleaning products often contain phosphates, antibacterial agents and other compounds that may not be removed at your water treatment plant. Any machine lubricants or fuel.These materials are toxic and may be corrosive, jeopardizing both your water supply and your plumbing. Most municipalities have recycling and safe-disposal facilities. Check with your county government about how to properly dispose of your unwanted medications, household chemicals, machine fluids and paint. Let your hot greases and oils cool down and dispose of them in the trash. Learn to compost your coffee grounds, eggshells and other produce waste or, if you cannot compost, put them in the garbage, too. If you follow these safe practices, you’ve reduced your chances of a clogged or damaged drain considerably! If you do experience a blockage, call your plumber. He’ll be able to assess your problem and safely get things flowing again. Fully trained, licensed and insured staff. Professional, courteous and clean technicians. Jeff came out to fix the water leak. It turns out the cartridge retainer nut was loose on the supply line. He did a great job repairing the leak and letting me know how to clean my disposal. I would like to make a complement to Wayne and Atlas plumbing team. On March 16th, have plumbing emergency late evening. I called Atlas plumbing (who worked with Toll Brothers put original plumbing at my house). Within 2 minutes we received phone call from technician (Mr. Wayne). Wayne was very knowledgeable, courteous, and his integrity is noticeable. I would love to have Wayne to work with us again if we ever needed help. Today I have service call again… (Ed. Note: at a different property address). I spoke with Taylor several times and she is very pleasant to talk to. Mr. Stone you have a good staff and I am pleased to find your company to work with. I will refer anyone to Atlas Plumbing any day. Your plumber came already and fixed both things! You guys rock! I will definitely be calling you guys and referring my friends to your company if I have any more plumbing issues. We had a main line clog backing up sewage into the basement shower last night. Your plumber Mike drove out at 11pm and resolved the problem quickly. He was very professional. We appreciate him coming out here late on a Friday in the cold to help us. Our licensed technicians are fully trained to diagnose and repair any plumbing issue. We provide high-quality, courteous service and act in a professional manner throughout the service visit, leaving the work area clean and tidy. We strive for excellence in plumbing and customer service at each and every service call.